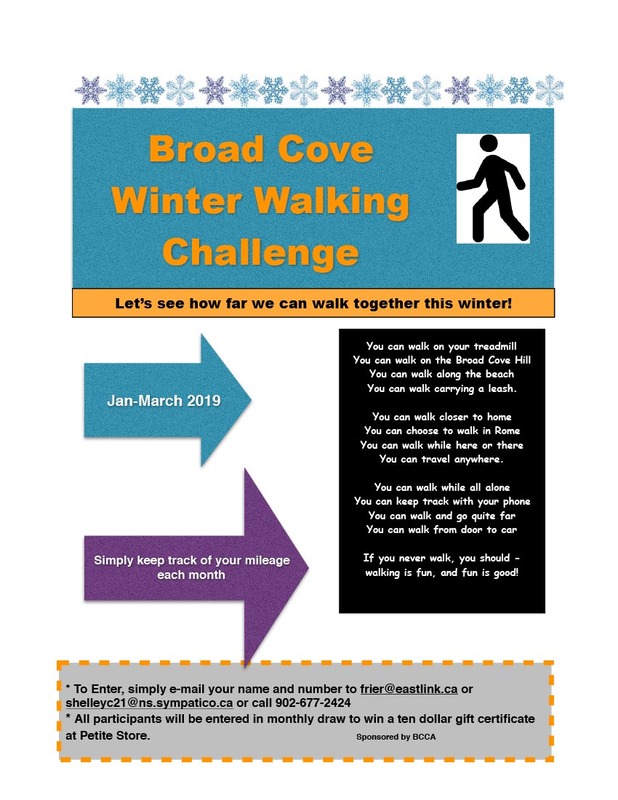 We would like to kick off 2019 with a walking challenge and you are all invited to participate, whether you walk a teeny tiny bit or a whole heck of a lot, whether you are in Broad Cove or somewhere else in the world. 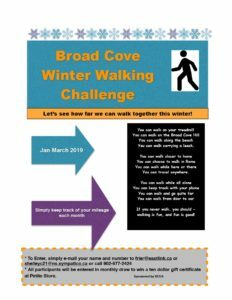 All you have to do is sign up, keep track of how far you walk each month for January, February and March and send us in the number at the end of the month. We will add up the totals and see how much mileage Broad Covers put on in a month. You can get started tomorrow or you can join in at any time throughout the winter. Sign up by messaging this page or e-mailing frier(at)eastlink.ca – only name, e-mail and phone number necessary. Keep track of how many kilometres you walk per month. You can walk carrying a leash.